During the Cannes boat show 2018, Astondoa presented the new 377 Coupe. The second model in the Coupé range, which represents the evolution of the shipyard towards a more modern, sporty, original, and bold aesthetics. 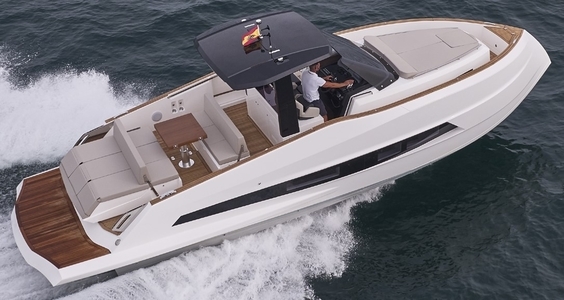 The 377 Coupé is also Astondoa entry level boat for Spanish builder which spans in size up to a 197 feet project in its Steel range. The 377 Coupe apart being a sport cruiser can also be labelled as a day-boat or a tender, thanks to its spacious cockpit. Sporting a T-top and a full walk-around in its entire perimeter only with one step. it has three different areas: two sunbathing areas; at the bow and stern, and a third half-length area, which connects the galley and fridges space with the triple pilot seats in front of a modern center console helm station with harmonious and modern instruments and multi-function touch screens. The 377 Coupe also features a very useful store box under the stern sun-pad for water toys. Inside the 377 Coupe presents what Astondoa calls the lounge/cabin with its refrigerator and audio/TV system, completed with a spacious head with shower cabin, exceptional for its length, and a second cabin with two beds. The Astondoa 377 Coupe is standard powered by twin Volvo 260hp diesel engines which allow for a top speed up to 36 knots. Optional engines for the Astondoa 377 Coupe are twin larger 300hp diesel engines or twin petrol gas of 300hp.